The largest spending cuts in history are still nothing. According to various news sites, this past weekend two completely different events took place. On the one hand, under pressure from Republicans and the Tea Party, Mr. Obama and the Senate Democrats agreed to the largest real discretionary budget cuts ever enacted in all of American history - somewhere between 60 and 80 billion dollars. At one and the same time, our lily-livered Republican leadership knuckled under to the Democrats' big-spending demands and funded 99.9% of what they asked for. Which is true? The problem with our politics, our economy, and our country, is that they both are. This graph plainly illustrates the problem. As large as the cuts sound to any normal person, in comparison with the budget as a whole, or even with the deficit, they're practically nothing. When you're about to be thrown out of your house, does it make a difference if you decide to eat a frozen pizza instead of going out to a restaurant one last time? It makes some difference - every little bit helps - but in the grand scheme of things, one restaurant check doesn't decide between poverty and wealth. Yet we're in a place where, when the Republicans timidly suggest that DiGiorno's isn't really so bad, the Democrats scream that innocents will shortly be starving in the streets and declare "a new Civil War fight" - when, recalling which side the Republicans were on the last time they fought a Civil War and the good which was accomplished thereby, perhaps political determination of that magnitude is what we desperately need. Pundits on the right are arguing that the recent budget deal was a Republican victory because the narrative is all about cuts - as in, the only question is how much we'll cut, not that there'll be cuts. True. But with cuts so teeny, who'd notice? During the time Congress spent arguing about the cuts, our government borrowed many times that amount: the daily national deficit is $3.4 billion. Paul Ryan's recently released budget, in comparison, seems like a masterpiece of common-sense rationality - until you realize that even his plan doesn't actually balance the budget anytime soon. Headlines scream about the trillions he wants to cut. In comparison with Obama's wishes that's so, but according to Ryan himself we can't even balance the budget - not pay off the debt, simply stop it from growing anymore - until 2040! Which is nonsense: we don't even know who will be President two years from now, much less three decades. One supposes that the President three decades ago, none other than Ronald Reagan, would scarcely have imagined today's national debt of near $15 trillion. So, the largest cuts ever seen are still a drop in the bucket? That doesn't speak to their boldness; it merely underscores the drastic nature of the medicine required. At least our politicians and the media are finally - finally! - talking about cuts, and that's pretty much the only victory we see here. Of course, we could always default, either officially by not paying or in effect by hyperinflation. 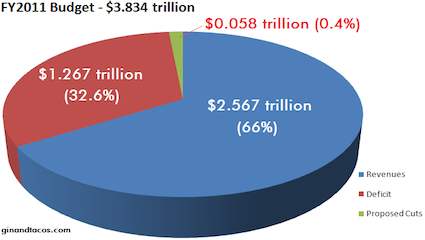 If we don't stop spending now, it's going to be one or the other, and a whole lot sooner than 2040. For ourselves, we wish the Republicans had just shut the government down... and left it that way. As messy as it would have been, it's a whole lot less messy than the total collapse we are still barreling towards hell-for-leather. As a young man, I always thought that retiring in America would be the best of both worlds. My dream has turned into a nightmare. Yes, we are well off financially, but money promises only security, not contentment. Each day I awake to a cacophony of negative news so repetitive, that only silence offers relief. + Our politicians are consumed with a lust for wealth and power. + The work ethic is dead. + Our Constitution and religion have become passe. In short, our Republic, The Founding Fathers Great Experiment, is spiraling uncontrolled toward the abyss. Comfortable in the knowledge that my resources cannot be affected by anything this government does, (short of outright seizure), during the rest of my lifetime, I've decided to divorce myself from any active participation in politics, current events, and most of society in general. A sad commentary, I agree. But it appears inevitable, to any student of history,that, The United States of America will follow a path of utter annihilation comparable to those of Ancient Rome, Greece, and Egypt. @tatum Do you have grandchildren? If not, what about ours? Given that you have the resources and the time, couldn't you at least to try to make a difference? The only thing necessary for the triumph of evil is for good men to do nothing. 'Twas true then, 'tis true now. Your question presupposes I have not tried to make a difference. I'd venture a guess that few people have invested as much time and money as have I, with the purpose of reversing our Republics current course. I happily surrender the baton to you. And yes, I have many grandchildren, that's what's so sad. Have you any advice, then? You must have won at least a few of 'em. Could you tell some stories? Stories? Yes. But to what point? As Rudyard Kipling said, "If history were taught in the form of stories, it would never be forgotten". That is the point. We are in the trouble we are in because we keep forgetting the mistakes of the past. They sound good, so we do them again. Please tell stories so we won't forget. Uhhh... What the hell does that have to do with anything?